A Jewish Minute: Chanukah 5770! Unbelievably we are arriving at Chanukah! I feel like we just celebrated Rosh HaShanah and then ... here we are. Chanukah is not a Jewish alternative to Christmas - although some may think so around about this time in the malls. In fact, the history of Chanukah took place before Christianity existed at all. Our narrative begins in 336 BCE - when Alexander the Great conquers the known world at the time. Alexander dies in 323 BCE, leaving his kingdom to his generals to fight it out amongst themselves. The kingdom gets split into parts - the Seleucids Greeks - located in the Syrian area of the empire end up in control of Israel. In 168 BCE, Antiochus IV begins sending out his decrees against the Jewish religion. The Hasmonean Revolt lasted from 167-165 BCE (when the Maccabees recaptured the Temple from the Greeks) and from then until 140 to drive the rest of the Greeks out of Israel. Shabbat is a very special day. Since it does come once a week, people have a tendency to take it for granted. The question is - why is the Shabbat all that important to the Jewish People? To continue that question, why would Antiochus think that this was an important way to destroy us? It's not only the Creation we are reminded of, but also the Exodus itself. The Exodus is a turning point in Jewish history. We go down to Egypt as a tribe of 70 souls and are taken out by G-d as a nation. Creation included everybody - all nations, everywhere. The Exodus was specific to the Jewish People. During the kiddush on Friday night we are saying that G-d takes a personal interest in us as a people - and in our everyday ordinary lives. G-d didn't just create the world and walk away, rather, G-d cares about each and every one of us. By banning the celebration of Shabbat - the Greeks were saying the exact opposite... G-d is impersonal and cannot be accessed by ordinary people. This is not Judaism. We do not need a middle-man to reach G-d. In today's world this would not have been a big deal. Knowing when the beginning of the Jewish month falls requires us to check our calendars and move on with our day. However, at the time of Chanukah, this was a big deal. The entire procedure of announcing the new moon (and the new month with it) required time and effort. While all this is true, we must understand why the banning of Rosh Chodesh is important. If you don't know when the beginning of the month is - you won't know when the holidays fall. You won't know when to celebrate any of them whether it's Rosh HaShanah, Pesach, Sukkot or Shavuot, all holidays established in the Torah. Once Rosh Chodesh is eliminated, those holidays are soon to follow. The Brit Milah symbolizes the direct connection between the Jewish People and G-d. By not allowing us to perform the brit milah the Greeks were effectively destroying the physical mark that identifies us as Jews. All of these decrees were specifically designed to destroy our spiritual lives as Jews. By examining these decrees one by one, we can see how the Greeks were attempting to eliminate our connection to our heritage and to our G-d. They didn't want to to destroy us physically - like in Purim - but rather to make us like everyone else. We shouldn't be any different than our neighbors. We celebrate two miracles on Chanukah. * The first is the military victory - the few Jews against the many Greeks. * The second is the miracle of the oil. The small flask of pure oil lasted eight days - long enough to make more pure oil for the Temple Menorah. We have to remember that the Jews of that day were not warriors, they were farmers or merchants. The Greeks were an occupying force in the land - in other words soldiers. Mattityahu, father of Judah Maccabee, began the revolt only when the spiritual life of the Jewish People was in danger, not before. The revolt was not about political freedom - but about our spiritual lives. When we light candles/oil - we think about the light of the Torah. The Torah is compared to a candle's light. While we are used to flipping a light switch to get our light these days - imagine a dark room with one candle. That one candle is enough to dispel a lot of darkness all on it's own. The Torah is a candle that we can illuminate the world and our own lives with. * Do I light Shabbat candles Friday night? * Do I know when the Jewish holidays are? * How can I celebrate those holiday? * Do I believe that G-d cares about me? * How can I learn more about my heritage? The world is many times a dark place. Each of us can be a Maccabee - bringing the light of the Torah into our lives. It is not an all or nothing process. Each new Jewish idea you learn, every Shabbat candle you light, every holiday you begin celebrating - brings another candle into a dark world and more light into your own life. We continue lighting Chanukah candles until the last night - which is also a Friday night - December 18th. We set up our candles from right to left, but always light the new candle first - which means lighting from left to right. You can find the find the brachot/blessings in a siddur/prayer book - but here they are in English. 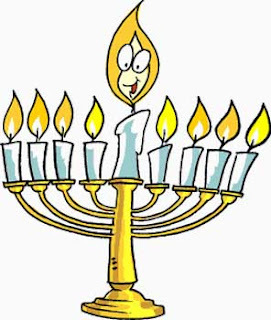 The next blessing is only recited on the first night or on the first occasion that a person lights a menorah during the course of Chanukah - The Sheh'Hechiyanu Blessing. For more information - including coloring pages for your kids - take a look here. Hello All! Let me introduce myself: My name is Shira, I'm happily married, grateful to have four little ones under seven years old and be a stay-at-home mom. I also have masters degrees in both education and political science and have spent at least 19 years in Jewish education (14+ in the classroom). Love to write and get feedback! Happy Birthday to Me! Twice!